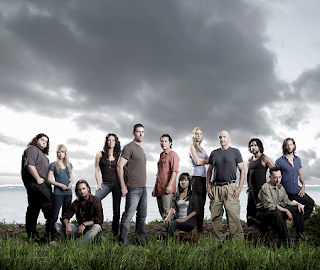 Lost's third season ended with the series at the very top of its game. The 'war' between the Others and the survivors of Oceanic 815 had ended with the decimated Others forced to flee their base of operations and their leader Ben a prisoner. Jack had successfully made contact with a freighter out at sea and it looked like rescue was finally imminent...except that, moments before his death, Charlie had discovered that the rescuers had been lying about their true purposes, a claim backed up by both Ben and Locke. In a format-breaking 'flashforwards' set three years in the future we also learned that at least Jack and Kate do make it off the Island, but Jack at least thinks it was a mistake and desperately wants to return. The Beginning of the End picks up right where we left off. Jack and Locke are at loggerheads over Locke's murder of Naomi. The revelation of Charlie's last words divides the camp in half, with a number (including Hurley, Claire and Sawyer) joining Locke but the majority remaining with Jack and Kate on the beach. A second flashforwards reveals that only six members of Oceanic 815 make it back to civilisation, including Hurley, who is forced back into the mental institution after having visions of Charlie. There he is visited by the sinister Mr. Abbadon and a calmer, more relaxed Jack (clearly this takes place before his prior flashforwards). This episode gets the season off to a storming start, although it commits the typical Lost sin of resolving little but introducing numerous new mysteries. This time around, though, the new mysteries are highly compelling. Confirmed Dead shifts things around somewhat. Four new characters arrive on the Island from the freighter: Miles Straume, an apparent psychic; Daniel Faraday, a physicist; Charlotte Lewis, an archaeologist; and Frank Lepidus, a pilot. Deft use of flashbacks reveals that these four were recruited by the shadowy Mr. Abbadon and his trusted lieutenant, Naomi, specifically for the mission to the Island. They seem to have their own agendas: Miles can apparently talk to the dead, Frank was a friend of Oceanic 815's pilot and wants to know what happened to him, Daniel is fascinated by the electromagnetic properties of the Island and Charlotte found what appears to be the remnants of a DHARMA Initiative experiment in Tunisia. All four new characters are terrifically well-drawn and we get to know them and see their interactions with both sets of characters in a fascinating manner. The Economist features the best use of a flashforwards yet, as we learn that Sayid is one of the Oceanic Six. He is also an assassin, working for a shadowy figure, and targetting certain individuals. An attempt to get close to one of these individuals in Berlin leads him into a doomed romance. Lost makes great use of its award-winning acting resource, Naveen Andrews, in a taut 45-minute thriller with elements of noir thrown in for good measure. Spectacular stuff. Eggtown is a highly unexpected episode. Kate's eventual trial for her pre-Island crimes is something I expect most fans thought they'd never see, or it would be glossed over as part of the finale. Not so. It is shown here in full detail and much more info about the Oceanic Six is revealed. Whilst the resolution is a bit hard to swallow (not unusual for dramatised courtroom proceedings) the final scene raises an absolute ton of questions about the Six and what the people on the outside world know about them. The on-Island storyline is also effective, particularly Locke's effective use of a grenade to coerce the truth from Miles. The Constant may be one of Lost's high points to date. Frank is taking Sayid and Desmond back to the freighter via helicopter, but a freak storm that takes place as they cross the 'boundary' between the Island and the outside world has a devastating effect on Desmond and he starts bouncing back and forth between the present and eight years in the past. This leads to a much more effective reitation of the ideas explored in Flashes Before Your Eyes in a most effective manner, building to one of the most emotionally satisfying moments in the series' history. Another winner. The Other Woman sees a minor slowing of the pace. Juliet's flashbacks reveals the true depth of Ben's twisted character and any doubts we had about him being 'bad' are finally dispelled...just as he finally wins Locke's trust and is let loose. The waters are further muddled as Ben reveals the freighter crew's seemingly malevolent mission and their mysterious backer just as Faraday and Charlotte reveal Ben's own plans to purge the Island of his enemies. Who is telling the truth and who is lying? A difficult question to answer and the episode refuses to give easy resolutions to the problem. Ji Yeon is the trickiest episode of the season so far, messing around with the flashforward and flashback devices to build to a highly ambiguous finale. It's a difficult episode to review without spoiling it. Suffice to say that it's another good Sun and Jin episode, who for all their apparent disconnection from the main storyline nevertheless have a highly consistent quality of centric episodes. We round things off with Meet Kevin Johnson. Sayid and Desmond are shocked to be reunited with Michael, last seen sailing off into the sunset with Walt in the Season 2 finale but now an engineer on the freighter. We now learn that Michael was recruited by the Others into infiltrating the boat and carrying out Ben's orders. Sayid is unimpressed with Michael's story and takes shocking action. At the same moment, all hell breaks loose on the Island and events build to a major cliffhanger ending with one recurring character dead, another seriously wounded and another's fate left hanging in the balance. We're a long way from the dull and plodding start to Season 3 here. Lost is firing on all cylinders and the relatively modest (five-week) wait for the remaining five episodes of the season seems a hell of a lot longer than it actually is. Forthcoming: Episode 409, The Shape of Things to Come, airs on 24 April on ABC and a few days later on Sky One. There will be 13 episodes in total in Season 4, shortened by three episodes due to the US Writer's Strike. It's great to see someone else appreciating the awesomeness of this season. IMHO The Constant was the best episode yet, but my friends didn't care for it. I had just read The Anubis Gates though, so maybe I was preconditioned to think time travel = awesome.